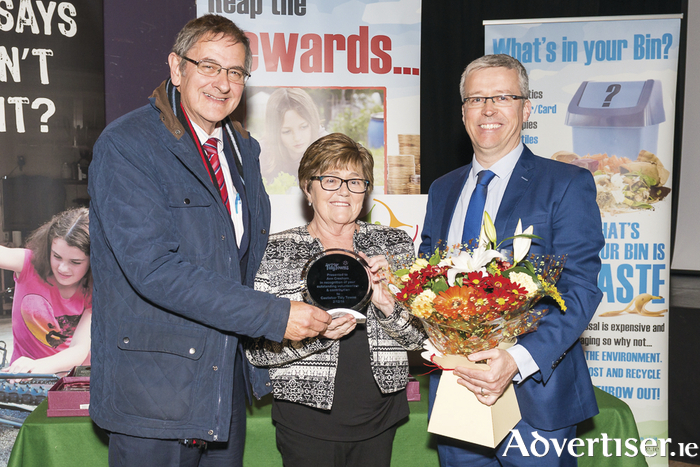 Ann Cresham receiving her outstanding contribution to volunteerism from Henry Kenny and Alan Mee, chairman, Castlebar Tidy Towns. There's wealth of events taking place across Mayo each week and we bring you some of the best in our Community Diary each week. If you'd like to have something included in Community Diary, please email [email protected] by 5pm on the Monday before the next publication date. The Castlebar Christmas Markets will take place in the Castlebar Tennis Club Pavilion on Saturday, December 17 and Sunday, December 18. The markets will run each day from 11m to 5pm. Come along and see for yourself the large selection of handmade gifts and home baking for the festive season. A Carol Service will take place in Christ Church, Castlebar on Monday, December 12 at 8pm, with the Choir from the Holy Rosary church and Castlebar Town Band performing from 8pm. A fundraising event in aid of Mayo Animal Welfare is being held in Castlebar Tennis Club this evening, Friday, at 8pm. Doors open 7.20pm. Music for Mutts is an evening of different musical acts from the area. Everything from rap, rock, pop, dancing and traditional. There will be spot prizes galore. A great night is assured. Please support this worthy cause. Tickets cost €5 and children u12s are free. Anam Cara, the organisation that supports bereaved parents, is hosting its monthly meeting for bereaved parents on Thursday December 15 from 7.30pm to 9pm in the Family Centre, Chapel Street, Castlebar, Mayo. North Mayo/South Sligo is hosting an historical lecture on Dr Kathleen Lynn, Sinn Féin politician, 1916 leader, and women's rights campaigner by noted historian Margaret Egan Langan in the Twin Trees/Downhill Hotel, Ballina tonight, Friday ) at 8pm. Born in Mullafarry, near Killala and having observed the effects of disease and poverty of her community she decided to become a doctor. Having joined the Citizen Army, during the 1916 Rising she treated the wounded, comforted the dying, and took an active part in the Rising itself. She became a Sinn Féin politician, founded St Ultan's Hospital in Dublin, and was elected to Dáil Éireann in 1923. Mayo should be rightly proud of this remarkable woman. The final lecture in the Kilmovee Winter Lecture Series will take place next Wednesday, December 14 at 8pm. The lecture is "The History of Poitin" by John Brennan. Hear more about Ireland's favourite illicit tipple. Doors open at 7.30pm and lecture starts at 8pm. Admission is €5 and includes lecture, Q & A session, and tea/coffee and biscuits. All ages are welcome. A great way to kickstart your Christmas. A Common Sense Parenting course for parents, guardians, or grandparents who want to build on their existing parenting skills or want to learn new ways to deal with their children’s behaviour is running in the Maple Youth Centre, Ballinrobe, from 10am to 12.30pm each Wednesday for seven weeks, starting on January 11. The course is delivered by trained and experienced public health nurses. For more information contact Breda Connolly (094 ) 9371196 or Breda Rogers (094 ) 9367529. There will be celebrations in Ballyheane on December 10 as the Christmas lights will be officially switched on. There are 17 trees along the village road with 1,000 lights each and a Christmas tree in front of the church with 1,200 lights. Santa Claus will be arriving in the community centre at 5.30pm with a treat for all the children. The official switching on of the lights is at 7.30pm. Members of the Clew Bay Pipe Band will be on hand to rouse the spirit. On Wednesday December 21, the Croagh Patrick Heritage Trail is hosting its annual 2km Winter Solstice Walk to Kiladagan, Murrisk, Westport. On this date at approximately 1.50pm the sun is observed to rest on the shoulder of Croagh Patrick. When this phenomenon occurs, it lines up exactly with the alignment of four standing stones in a complex of other archaeological features at Kiladangan, lasting about 10 minutes. The standing stones are dated to the Neolithic period 4000 to 2400BC and are aligned NNE-NNW from a stone row of 5.5m long. Depending on fine weather, it is a wonderful sight to see. Meet at Campbell’s Pub Murrisk at 1pm, there is a €5 cover charge. For more information call Clogher Heritage Centre at (094 ) 9030687 or email [email protected]. On Saturday December 10 from 5pm to 7pm the first Ballycastle Christmas experience will be held in The Shambles, a celebration of the spirit of Christmas in a stunning setting. Santa and Ms Claus in their grotto, the elves in their workshop, a living crib with real animals, live music and other entertainment, food and drink for every taste, Ballycastle Christmas experience promises a great evening out for the whole family. The Cara Iorrais Christmas fair will be held in the Broadhaven Bay Hotel on Sunday December 11 from 3pm to 7pm. It promises to be a fun and festive day for all the family. View the beautiful displays of local goods and crafts. Relax with a glass of mulled wine or hot chocolate, while listening to some beautiful Christmas melodies. Santa and special guests will be arriving throughout the day. Due to unprecedented demand, Knock Christmas Market has announced it will extend the market over two floors. The market takes place at Knock House Hotel on Sunday December 11 from 12 noon to 4pm. For more information interested vendors can contact Leonie Kilroy at 086 8486924 or email [email protected] Follow Knock Christmas Market on Facebook. A special blessing for expectant mothers will take place at 12 noon in the Apparition Chapel, Knock Shrine, tomorrow Saturday. All expectant mothers are welcome to join us for this lovely event. Bingo continues every Monday night at 8.30pm in Balla Community Resource Centre with excellent prizes. Balla Community Resource Development AGM will be held in Balla Community Resource Centre on Thursday December 15 at 8pm. All members are invited to attend. Now in its fourth year the Baile an Chaisil Christmas cycle takes place on January 1 at 12 noon, there is a 36km route or a family 12k cycle. This year’s chosen cause is St John's Hall. Baile an Chaisil Cycling Club will continue its weekly spin for the winter months on Sunday mornings at 9am from the Shambles. St Angela's NS, Castlebar, will be having a Christmas fair in the school on Sunday December 11 from 1pm to 3pm. All are welcome, with Santa making a special appearance and lots of fun for all the family.